For starters, Ce Cubic Effect has made this wonderful dress/top that is a golden, straw-colored, loose-weave linen fabric. It is done with all the usual panache of Ce Cubic Effect. The Muism pants are a golden beige…. also in a linen look fabric. The pants come with two lengths, the one shown and an ankle-length version. 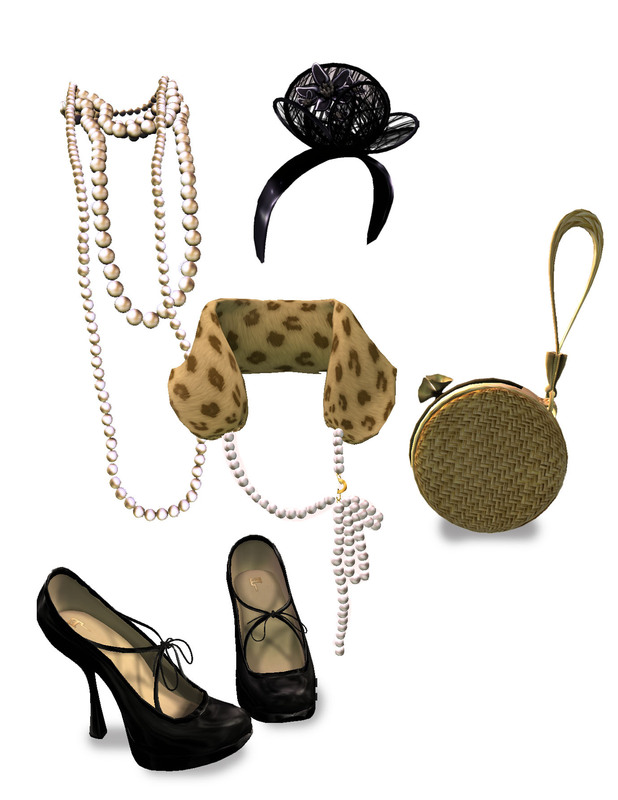 All the accessories are golden. LG Boutique makes the wonderful straw bag which is available in both large and small sizes and many other colors. ❤ Gyorgyna! Donna Flora’s golden necklace has a bit of fabric shot through with golden threads that emphasize the beautiful stones. The pumps are from Pixel Mode and are must-haves (they are also available with socks). By the way, the fantastic tat is from Zahir by Astrid Soon. I love tattoos with writing! To see more any image in more detail just click on it. Landmarks and credits below the cut. …would I wanna be anywhere else? Those lyrics have been going around in my head all day. Just the chorus, but it won’t stop… Maybe it’s because finally the sun IS in the sky and it is shining. Anyway maybe that is why I feel like wearing something fun. I got this great headpiece and new flower and lace skirt from LG Boutique (<3 Georgyna Larnia) that I wanted to wear so I started there. The little leopard tippet with pearl closing from Atelier AM is new too and something I really love but hadn’t worn yet so that went into the mix. You can’t have too many pearls so I added a long string of pearls (from AA as well). 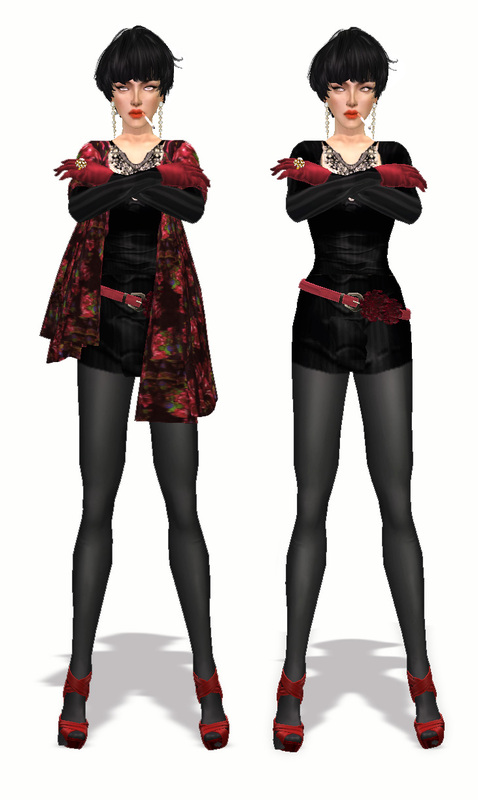 I liked the outfit worn with the red Mongolian fur from Fishy Strawberry so I show it here both with and without. The little woven straw hand purse is from LG boutique too and it is sooooooooo cute…..and comes in tons of colors. Oh why, oh why would I wanna be anywhere else? Lately I’ve been in an exploring mood and I keep coming across the most amazing places. Kowloon is not a new sim and many of you probably know it since it is popular with photographers, but I didn’t. I enjoyed snooping around the nooks and crannies and taking a few pictures there as well. Kowloon sim is based on a walled city in China that existed until it was demolished in 1993. (From Wikipedia) Kowloon Walled City was a Chinese military fort in Kowloon, Hong Kong, which became an enclave after the New Territories were leased to Britain in 1898. Following Japanese occupation during World War II, the Walled City developed into an extremely dense, largely ungoverned urban settlement. From the 1950s through the 1970s, it was controlled by Triads and had high rates of prostitution, gambling, and drug use. In 1987, the Walled City contained 33,000 residents within its 6.5-acre (0.03 km2; 0.01 sq mi) borders. In January 1987, the Hong Kong government announced plans to demolish the Walled City. After an arduous eviction process, demolition began in March 1993 and was completed in April 1994. Kowloon Walled City Park opened in December 1995 and occupies the area of the former Walled City. Some historical artifacts from the Walled City, including its yamen building and remnants of its South Gate, have been preserved there.